Texas Schools Grapple With Big Budget Cuts State lawmakers slashed more than $4 billion this year from education, one of the largest cuts in the Texas history. More than 12,000 teachers and staff have been laid off. Some districts halted construction on much-needed new schools; others have parents pay for extra programs. And low-income students may fare the worst. School funding in Texas is in turmoil. State lawmakers slashed more than $4 billion from education this school year — one of the largest cuts in state history — and more than 12,000 teachers and support staff have been laid off. Academic programs and transportation have been cut to the bone. Promising reforms are on hold or on the chopping block. Next year, the cuts could go even deeper. Schools in Pasadena, just outside Houston, have seen tight budgets before, but never like this. There was $21 million in cuts this fall alone and 340 positions eliminated, Candace Ahlfinger, an associate superintendent of schools in Pasadena, says. Of those cuts, about 180 were teaching positions and 160 were support staff, she says. Special education teachers who worked with dyslexic kids: gone. Teachers' aides: gone. Dozens of bus drivers, crossing guards and security personnel: gone. With the district's $350 million budget shrinking and more cuts on the horizon, Ahlfinger says: "Everything has been on the chopping block. There's not been a sacred cow. There's nothing that we have said 'No, we cannot touch that.'" The state granted Pasadena schools a waiver so that the district could legally raise class size above the maximum 22 mandated in grades K-4. About 7,000 schools have been granted such waivers statewide, a three-fold increase from last year. Still, every morning teachers in Pasadena grit their teeth and pretend everything is fine. School officials here considered asking parents to pay for some services, but 80 percent of families in the district live at or below the federal poverty level. For the first time since World War II, the state hasn't funded what it promised to fund. In many school districts across Texas, though, parents are footing the bill for things like bus transportation, field trips, athletics and uniforms. "Something's got to give, right?" says Jackie Lain with the Texas Association of School Boards. "They're charging for any of the extras that they don't absolutely have to provide, so that they can keep teachers employed in the classrooms." Lain says the 6 percent cut in school funding this year was bad enough. Next year, it will be 8 to 9 percent. Even wealthy school districts are feeling the pinch. Leander is a bedroom community just outside Austin that's growing like crazy, but it doesn't have enough money to open two brand new schools that it built to relieve overcrowding. With less money from the state, Leander had to cut $20 million from its budget and lay off 213 employees, 50 of them classroom teachers. 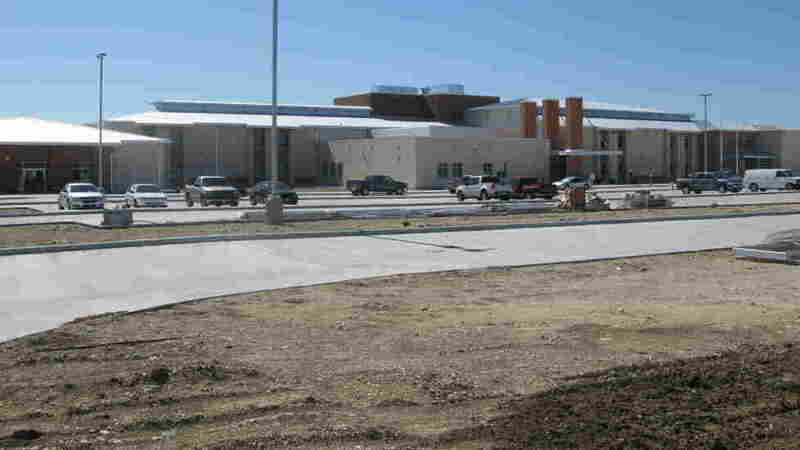 Leander was supposed to open what's known as Middle School No. 8 this year. It's an enormous building and there's a lot of construction going on at the site, but that was slowed this summer because the district cannot afford to open it. Leander schools Superintendent Bret Champion says Texas raised school funding consistently every year for the past half century, until now. "For the first time since World War II, the state hasn't funded what it had promised to fund," he says. At a football game between Leander High and Vista Ridge High School, the funding crisis is the last thing on parents' minds. The stadium fills quickly; it's supposed to be a good game. "I'd spend a thousand bucks out of pocket myself to make sure it'd stay," says Ross Briton, whose son plays football. "I'd work two jobs if it took that to do it. End of story." Briton says it's not just a sport here: It's part of the culture and a big part of the community's identity. The district should pare down the curriculum before it cuts football, he says. "I would cut most liberal arts out of the high school. I'd keep math, science, reading. I'd add the vocational education back, because I think there's too much fluff," Briton says. Several parents in the parking lot nod in agreement as they walk away; others stay behind to say they disagree. Cutting instructional programs, they say, is more damaging than cutting sports. Kate Patterson works for a local nonprofit that ran a program for struggling readers in the Austin area, including Leander. Sadly, it's been cut, she says, and lawmakers don't seem to care. "Honestly, I'm not looking to the government anymore," Patterson says. It's as if Texas has thrown in the towel when it comes to education, she says, but some lawmakers blame voters. "Legislators respond to what they hear," says Scott Hochberg, a Democrat and state representative from Houston. "I think they need to put their votes where their mouths are," he says. Texas, meanwhile, is sitting on at least $5 billion in its rainy day fund. It's mostly gas and oil revenues. Hochberg says lawmakers refuse to draw from the fund to blunt the education cuts because the governor told them not to. "The governor drew a very, very sharp line in the sand [saying] that the rainy day fund, which was specifically designed for periods of economic slowdown, would not be touched," he says. NPR repeatedly called Gov. Rick Perry and numerous Republican legislators asking them to comment for this story; they refused. The president of the anti-tax lobbying group Empower Texans, however, did not. For too long, Michael Sullivan says, the state has thrown tons of money at education. "We've assumed that, well, more money equals better education. Let's just spend more money," he says. "How much more money do we need to spend? ... More, more, more, more. We have doubled real per pupil spending in the past 10 years." And yet, Sullivan says, Texas has nothing to show for it. Schools are still graduating students unprepared for college or work; that's why school districts have no credibility when they complain about funding, he says. Sandy Kress, an attorney in Austin with close ties to both political parties, doesn't go that far, but he too faults school districts for looking at this as a crisis rather than an opportunity to show they can be more efficient with the money they get. The result is that children will be left behind, gaps will grow again and we may be in a place where we are retreating instead of advancing for the first time in 50 years. "The system is getting defensive about having to make the changes it has to make," Kress says. "It's resisting change and accountability just as people who are paying the taxes are getting tired of paying the taxes. I am definitely worried." Kress says efficiency and accountability are crucial, but he worries even more that Texas will revert to the bad old days when school districts used tight budgets as an excuse for neglecting low-income and minority students. "The result is that children will be left behind, gaps will grow again and we may be in a place where we are retreating instead of advancing for the first time in 50 years," Kress says. "And this is disastrous." Already, the $4.3 billion in school funding cuts seems to have made the disparity between poor and wealthy school districts worse. A poor district now gets $800 less per student from the state than a wealthy district. More than 300 school districts are now suing. They're hoping the courts will declare the cuts and the school funding formula in Texas unconstitutional.